There are those who have struggled with God and with humans and have overcome. It is through these whom The Lord is now going to BIRTH SOMETHING NEW. 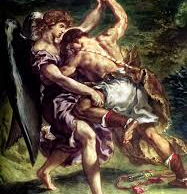 Just as Jacob wrestled with God and overcame (Genesis 32:28), there are those who have fought through the dark night of the soul and overcome. They have faced challenges, setbacks, disappointments and tests to their faith. These are ones who have stayed the course and have fought for their inheritance. It is these very ones through whom a new work is about to come forth. Jacob came out of his spiritual wrestling match with a wrenched hip and limp in his walk. Even so, he walked into his destiny. He learned who he was and Whose he was. He received a new identity and new assignment which secured his legacy. Out of his own pain, he birthed an entire nation. So too, for many believers who now walk with a limp after a spiritual wrestling match with heaven, God is birthing a new thing. This new thing, however, will not be like an infant. It will not go through the same labor process as your firstborn, but will be born “ready-made”. It will already have a mark of maturity, anointing and destiny on it BECAUSE of the time-tested faith in which it was conceived. No, YOU have not labored for it, HE has! That which has been in His heart all along is about to come out of your side, for that’s where HE IS. There are pastors, leaders, men and women of faith who have come through a season of searching and struggling in a spiritual battle with both God and man that have caused scars and wounds. EVEN SO, the Lord is already AT YOUR SIDE, having conceived an even greater inheritance and blessing than you first imagined. It is from the VERY PLACE OF PAIN that your new ministry will come forth. It is from THOSE VERY TRIALS that God will give you NEW AUTHORITY, NEW GRACE AND NEW LIFE. Do not despise your limp or give up on your inheritance. Press in like Jacob and REMIND GOD OF YOUR BLESSING. Rejoice in those things which have marked you. Know that the best is yet ahead and the deepest desires of your heart have not been forgotten. Go forward and claim your blessing for it is yours, says The Lord.